Archbishop of Mayence and subsequently Grand Duke of Frankfort-on-the-Main; born Feb. 8, 1744; died Feb. 10, 1817. He was one of the noblest German princes and statesmen, and took a friendly and liberal attitude toward the Jews. He always favored their complete emancipation; but was long prevented from realizing it in his own dominion, through the Frankfort patricians and, especially, the Rhenish Confederation. After the dissolution of the latter—when Frankfort created a constitution of its own on the principle of equality—Dalberg enacted (Dec. 28, 1811) a special law decreeing that all Jews living in Frankfort, together with their descendants, should enjoy civil rights and privileges equally with other citizens. For this the Jews paid him 440,000 florins, in consideration of which the annual protection tax of 22,000 florins was abolished. 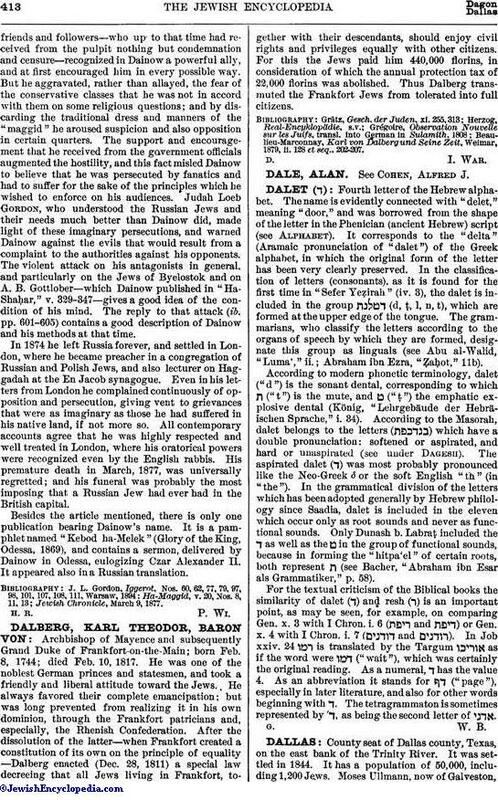 Thus Dalberg transmuted the Frankfort Jews from tolerated into full citizens. Beaulieu-Marconnay, Karl von Dalberg und Seine Zeit, Weimar, 1879, ii. 128 et seq., 202-207.